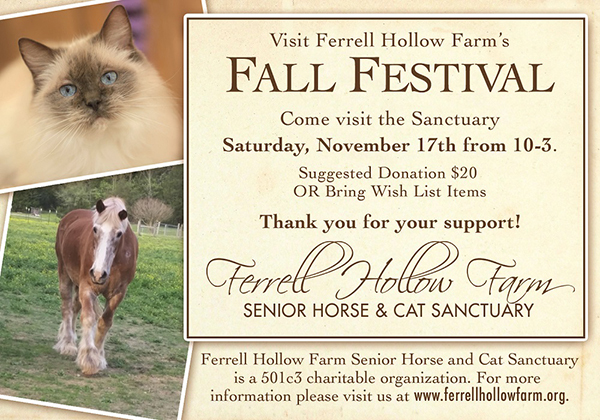 READYVILLE -- Ferrell Hollow Farm Senior Horse and Cat Sanctuary (FHFSHCS) is excited to invite the public to attend their Fall Festival Celebration! The Fall Festival will take place on Saturday, November 17th, 2018 from 10:00 a.m. to 3:00 p.m. where FHFSHCS welcomes the public to tour the Senior Horse & Cat Sanctuary as well as learn about the sanctuary programs. Guests will be able to stroll part of the 70 acre property, visit the Memorial Gardens and see the senior equine and feline residents. There will also be unique merchandise for sale that will directly benefit the sanctuary and its residents. 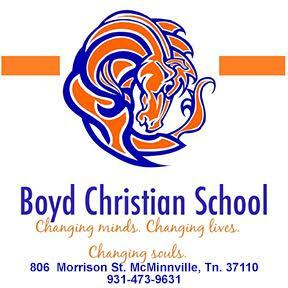 Suggested donation is $20.00 and/or bring Wish List items for the Horses and Cats! Your support is needed for us to provide the quality of life our senior residents deserve. Cindy Myers, founder states of their expanded mission "Offering sanctuary for senior cats allows us to serve yet another population that is often overlooked and find themselves at risk of euthanasia in shelters." The Senior Cat Sanctuary accepted its first aged cat in August 2016 and since then FHFSHCS has welcomed and saved 12 more at risk senior cats into their sanctuary in 2017 and 2 so far in 2018. While some renovations have been completed to provide a safe and enriching environment for our feline residents, ongoing renovations are necessary so we can help even more at risk felines. In addition, we will have 4 young cats that we rescued up for adoption at our Fall Festival! Our mission is to advocate and care for special needs senior horses and cats that require permanent sanctuary setting and are not afforded adequate care if left in their current situation. The horses we take in are over the age of 25 and who have suffered in their former lives--after years of providing hard service to human beings, some were abandoned, some were starved, some were taken to kill auctions, some were abused. For more information about our organization and our wish list, please visit www.ferrellhollowfarm.org.